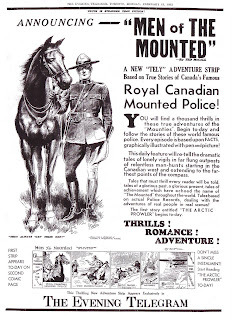 Hall of Famer Ted McCall created the first North American comic strip dealing with the mounties, Men of the Mounted, on February 13, 1933. King of the Royal Mounted from King Features Syndicate did not begin until Sunday, February 17, 1935. Ontario comic historian Kenneth S. Barker wrote an informative article for Inks magazine titled Men of the Mounted in 1997 and kindly provided the above information on the Men of the Mounted and Robin Hood strips. Below is the first Robin Hood strip from Sept 23 1935. Labels: Hall Harry, McCall Ted, Snelgrove Charles R.